Shape Named Best Manufacturing Employer | Shape Corp. 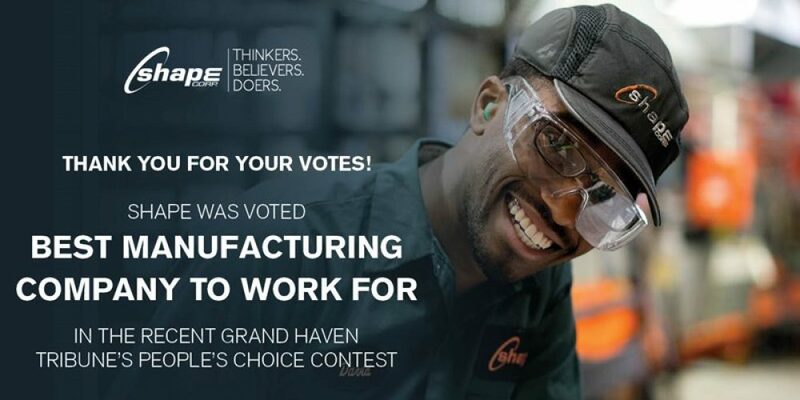 Thanks to votes from our team members and community, Shape was voted the Best Manufacturing Company to Work For in the 2017 Grand Haven Tribune People’s Choice awards. After a month-long nomination process, the top five nominees are presented and move on to the voting stage. There were more than 100 categories for people to vote on. 809 people voted in the Best Manufacturing Company to Work For category and Shape took home the title with 364 votes, 100 more votes than the runner-up. Thank you to all who voted. We appreciate your pride in the Shape Family.